Description: A subtle white metallic scroll invitation has a vintage motif design in gold in the centre and space to print names on the sides. 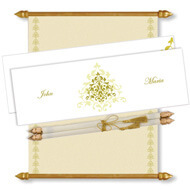 The inside scroll is made of off-white material with matching gold borders. There is an outer envelope as well matching the main box. Suitable as Scroll wedding invitation or Anniversary Scroll Invitation.